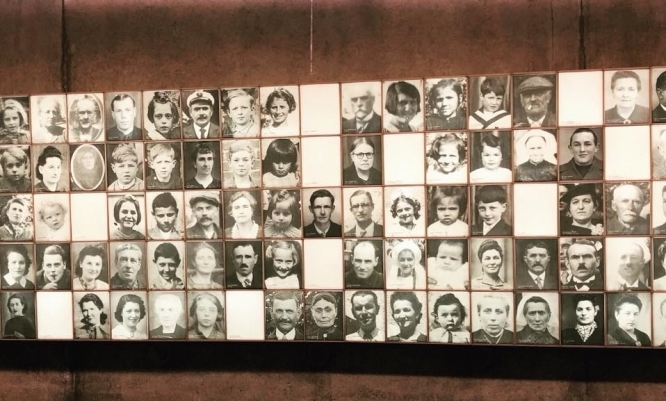 Visitors to the village of Oradour-sur-Glane, which was destroyed by Nazis in 1944, can now see the faces of most of the 642 victims of the massacre. The walls of the tunnel leading to the ruins of the Haut-Vienne village from the Centre de la Mémoire have been lined with 530 images on porcelain of those who died in the atrocity. Plain white plaques bear the names of those where portraits have not yet been found. The collected photographs were transformed into "Chromolithographies" by Christian Leblois, who lives in Limoges. "By putting the chromos on the plates, I was led to fix the glance of each of these people. It was terribly poignant... I went back to the Centre de la Mémoire this weekend to see what it installed. I have to say, it takes a lot of guts." he said. One June 10, 1944, some 200 soldiers from the 4th SS Panzer division rounded up 642 residents of the village. Of those present, 190 men were taken off to a series of barns, and the 247 women and 205 children taken to the church. The men were shot in the legs by machine guns, then the barns they were in were set alight. The church, too, was set ablaze, and anyone who tried to escape was gunned down. The horrified residents of a neighbouring village who discovered the massacre vowed to maintain the ruins. A new village was constructed a kilometre away, and today the old town remains in ruins as a reminder of what happened and as a monument to those who perished.